family activity between parents and kids. Illustrations are built up in simple shapes and colours for simplicity to identify with children. A Strawberry is shown to be visually clear, taking up more space on the front cover than other objects; this is so children can easily identify what the seed packet will grow. Little characters of fairies and pixies aid the sway over children who live in Fitzroy as they are inspired by carvings of the Fairy Tree at Fitzroy Gardens. These figures relate to the suburb of Fitzroy and will be recognisable among the nursery customers. Elements and designs formed in the Fitzroy Nursery branded seed packet shows similarity to the Web Interface designs through identical illustrations, embellishments and similar tonal qualities. The same organic KC Miss Kindergarten font is used throughout the two designs in a soil brown colour. The background is a pattern of clouds among a blue sky with floral vines curling around cream banners and text box’s. This design themes the visual of an outside garden with a fresh and youthful atmosphere. Research into layout of websites from the Wix Theme Garden showed a variety of templates on how to formulated an interface design and helped add-hear to my understanding of designing for web. Through this study I was able to apply a a grid system to my layout that is suitable for computer and mobile devices. The Home and Garden category when browsing templates shows a specific range of organic gardening themed designs such as the ‘Vegetable Garden’ template. This design makes use of a narrowed colour palette, applying certain tones to different fundamentals, Eg: negative space is a dark cream, boxes and borders are a light cream separating negative and positive space, and font is a dark brown to be clearly visible and contrasted against behind layers. Images are bright and colourful showing appealing fresh fruit, vegetables and plants. These designs showed me inspiring ways to construct a web interface that is well thought through compared to the layout of the current Fitzroy Nursery Page. The design elements compared to the current Nursery Website appear poorly thought through. The black background and font type is not appealing to the theme of a Nursery selling gardening supplies. Arrangement of images appear randomly laid out and messy due to uneven image size and different tonal qualities. The difference in appearance between a good and bad interface design is clear to the eye and effects the customers need to buy products and revisit the site. 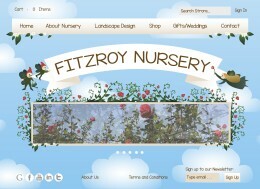 This has been taken into consideration when redesigning the Fitzroy Nursery Page. The design considers the theme, including earth nature colours, boarders embellished with floral illustrations and similar aesthetics to the seed template, creating a new signature look for the Nursery. Images display engaging photography of products whilst following similar size and tones. Through working up rough designs information is sectioned into a specific grid system that is repetitive throughout pages and improves the original site.